Pursuant to AEON Food Safety Policy, AEON strive to provide the customers with safe and healthy food and to ensure that all our food products are safe, wholesome and fit for human consumption; conform to safety and quality requirement in line with the laws of Malaysia, particularly the Food Act 1983 and the regulations made thereunder. 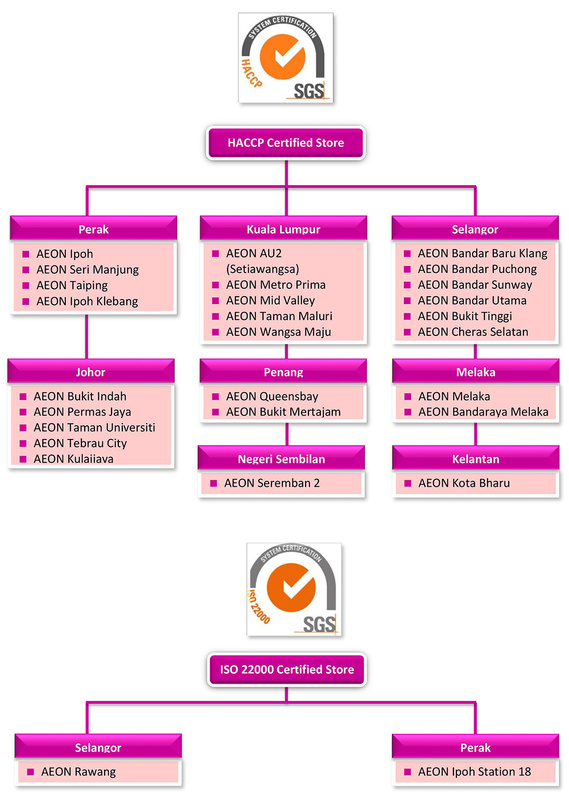 In line with AEON Food Safety Policy, AEON has obtained certification of Hazard Analysis And Critical Control Points (HACCP) & ISO 22000 from SGS (Malaysia) Sdn. Bhd for its Food Safety Management System (FSMS) practiced in AEON’s retail outlets and processing center. Disclaimer: All information provided in this site is solely intended for general knowledge and is not intended to be substituted for professional medical advice. AEON reserve the right to modify any of the content at its absolute discretion without prior notice. AEON endeavor to keep the information up to date and correct and AEON shall not be liable for any damage or loss arising in connection with this site or use thereof.